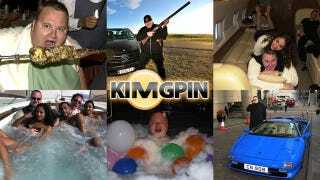 New Zealand news sources report that Megaupload co-founder Kim Dotcom was released on bail today almost exactly month after he was arrested. The only catch is that he can't stray too far from his house or use the Internet. Ouch. After being repeatedly denied bail, Kim Dotcom is finally out of jail. CNET noticed that news sources in New Zealand were reporting his release. A New Zealand court ruled he was no longer a "flight risk," because, apparently, Kim Dotcom doesn't have access to any of the money that would allow him to flee the country. As the founder of Megaupload, Dotcom has emerged as a bombastic symbol for both sides of the case. Some people see him as a hero and a victim, while others see him as a criminal. Next up for Dotcom is a hearing about his potential extradition to the United States to face charges for what the FBI called, a $500 million "mega conspiracy." That hearing was reportedly supposed to begin today, but the United States hasn't yet filed the extradition paperwork—US officials have until March 2nd to do so.